Good morning, Apryl with the Design Team here with you to share a tutorial on building a layout from start to finish. Project is featuring My Mind's Eye Jubilee I Want It All Bundle from FotoBella.com. 1. 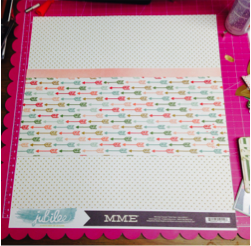 Select the Journey paper for the background of the layout. 1 2. 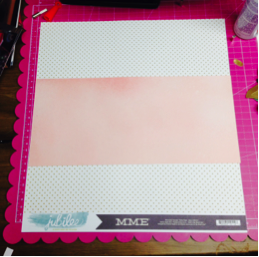 Second, choose the “Ride” Fields paper and trim it to 5 ½” x 12” and place it two-thirds of they way down on the background paper. 1 3. 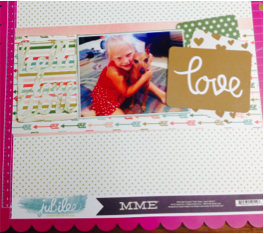 Select the “Ride” Love paper and trim down to 5” x 12” and layer it on top of the “Ride” Fields paper. 4. 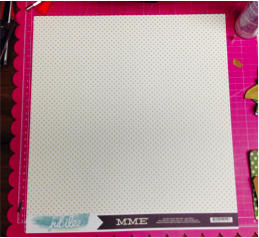 Matte the photo on white cardstock and then double matte it using the “Beautiful” Doily paper. 5. 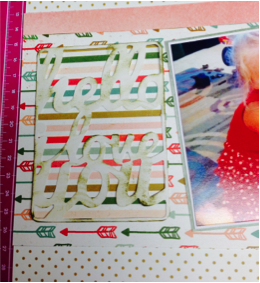 Choose the white “hello love you” title cards from the Beautiful Mixed Bag of embellishments. Ink it with dark green ink and matte it with striped side of “Wild” Ampersand Foiled paper. Trim the striped paper down so that it perfectly fits behind. 6. 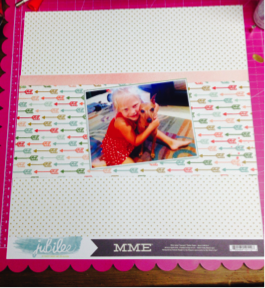 Using the “Journey” Journal cards, select several to layer and both sides of the photos. 7. 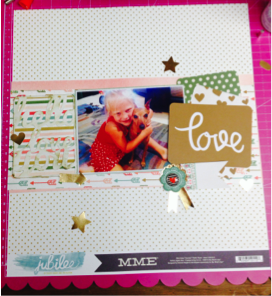 From the mixed bag, use the small gold hearts and gold stars to embellish the layout. 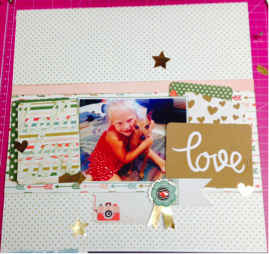 Layer the gold ribbon shape with a decorative brad. 8. Add the journal card with the camera on it below the photo. And now you have a beautiful layout!